Uncial was in use from the tail end of the Roman Empire (3rd Century) into the early middle ages (10th Century). In the 800 years it was the dominant hand in the west there were many variations, from “natural” hands to very formal carefully constructed hands. As calligraphers we choose a small number of excellent examples, one of which is the Stonyhurst gospel a tiny book found in the tomb of Cuthbert but written before his death in AD 687. The book is tiny - just 15 cm tall - and the “natural” uncial is even easy to read even though the language is Latin. This beautifully executed lettering is designed to be fairly easy to write and is the historical basis of the hand that we are going to learn. The image on this page is just to give you an idea of how the book looks. The British Library has fabulous images of this book (and many other manuscripts too). You can view every page and zoom in to look at every last detail - well worth a visit : click here. ​Other examples of uncial – sometimes called Artificial Uncial - are much more difficult to create. The scribe would have twisted and turned the pen to make different strokes. These contrivances make the lettering look impressive but producing it was would be slow and very skilled work. If you look at any uncial alphabet you will see letters that became our everyday lowercase letter is as well as those that are developed into our capital letters. The use of lowercase and uppercase letters did not arise until the 8th century, so the Uncial alphabet is neither a capital or a lowercase alphabet - making the good news that there are only 26 shapes to learn! (By the way, uncial also predates the use of dots on top of the letter I and J, so we do not include it in our alphabet. In fact, if we’re being accurate, the letters J, V, W, Y and Z were all later additions). Uncial is often seen as a Celtic form of calligraphy, and sits well with Celtic decoration, although in fact it was used throughout Europe and the Middle East. ​Its time in history coincided with a change of materials for writing: papyrus made from hammered reeds was a rough surface - discoveries of how to create parchment from animal skin gave a much smoother surface and with the advent of quills cut from feathers lettering became smaller and more refined. Are you sitting comfortably? When doing calligraphy, I nearly always write on a sloping surface. It’s really important for us all that we don’t stoop over our work – which soon leads to sore shoulders or worse. So have a think about the writing environment you’ve created for yourself and make it as comfortable for lettering and as well lit as you can. I cannot overstate the importance of being comfortable – how can we write beautiful flowing calligraphy if we’re not? If you have already done some calligraphy, and maybe even uncial before – that’s great and it will help you speed along – but I suggest you approach each lesson as if it’s all brand new to you – we all benefit from going back to the beginning in subjects now and again. Have a look at this sample of uncial and think about its characteristics – it is sturdy, strong and solid. We’d not describe it as flighty or light and airy – it’s a CHUNKY little hand. But it still has beauty – and part of its beauty is that there are repeating shapes throughout the letters. For example look at how similar the O,C and E are – the eye enjoys these repeated patterns. ​In fact Uncial is based on a circle, so before we whizz off into writing letters we’re going to play with circles…. A lot! 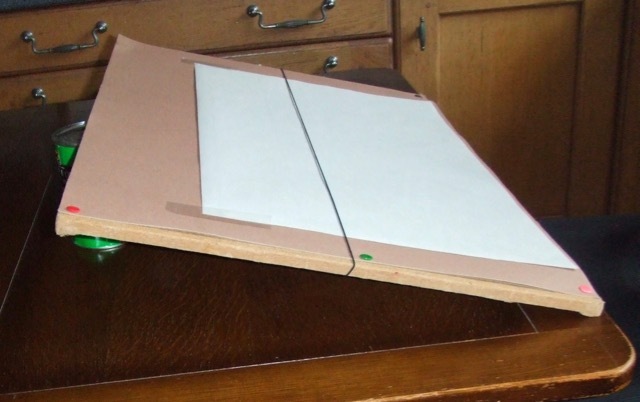 Grab a sharp pencil and a piece of paper – A4 printer paper is fine at this stage. Draw a circle. 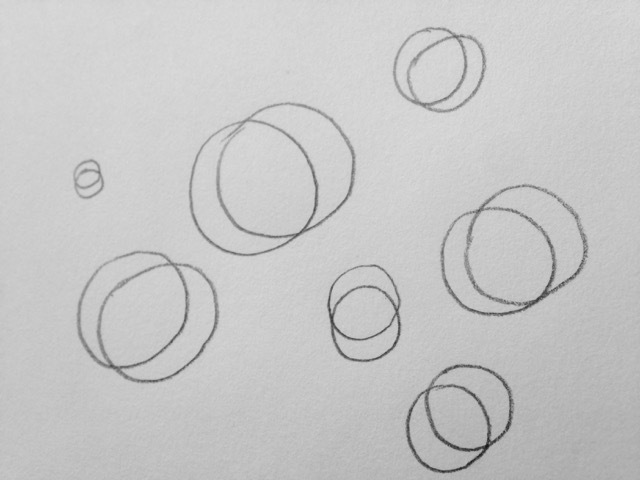 Now draw another one – and another – until you have 10 circles on the page. Did you make them all the same size, or different? Did you draw them with one stroke of the pencil, or two, or many? Make a mix of sizes from small (5mm or smaller) to large (60mm or larger). Try going slowly and quickly – which is better? ​Now try ruling a pair of lines 2 cm apart and do a row of 10 circles, each one just touching the 2 lines. The video is actual speed – this is not something I can do quickly! Two more circle based activities...... now try drawing pairs of overlapping identically sized circles, aiming to get 3/4 of the circle width in the overlap. This is difficult to do accurately, so don't fret over it - I just want you to get the hang of that shape. You should feel better when you see that mine in the right hand picture are pretty hopeless!! 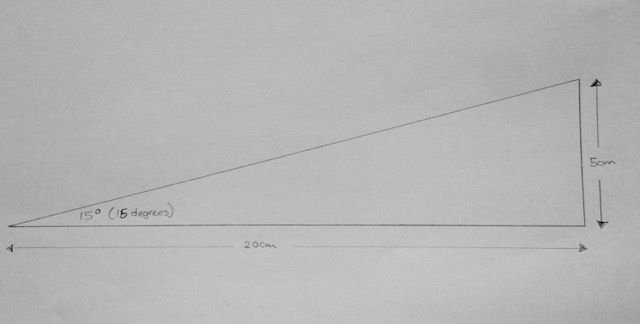 Rule a horizontal line on your page, now rule a line at 15degrees to it. Rule a line 1cm away from your 15 degree line - and create some overlapping pairs of circles (like you did just now) between those lines. 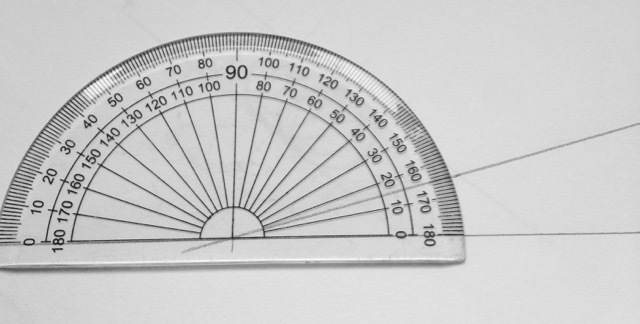 Send me two photos - one of a sheet with lots of circles on, and one of your pairs of circles on a 15 degree line.